Well, I went and made it out of Easter Island. I am very glad I went. As I told my guide, I feel privileged to have made it there. I can confirm now, through my own experience, that those statues (called "moai") exist. Seeing the moai in pictures was nothing like seeing them up close and in person. They are magnificent, and majestic, and mysterious, as they (seemingly) keep silent watch over the island. It's incredible. They are incredible. First, I know what you want to know: the water in the first toilet I flushed south of the equator did indeed go in the opposite direction from my toilet at home north of the equator. I had to fly to Santiago to get to Easter Island. 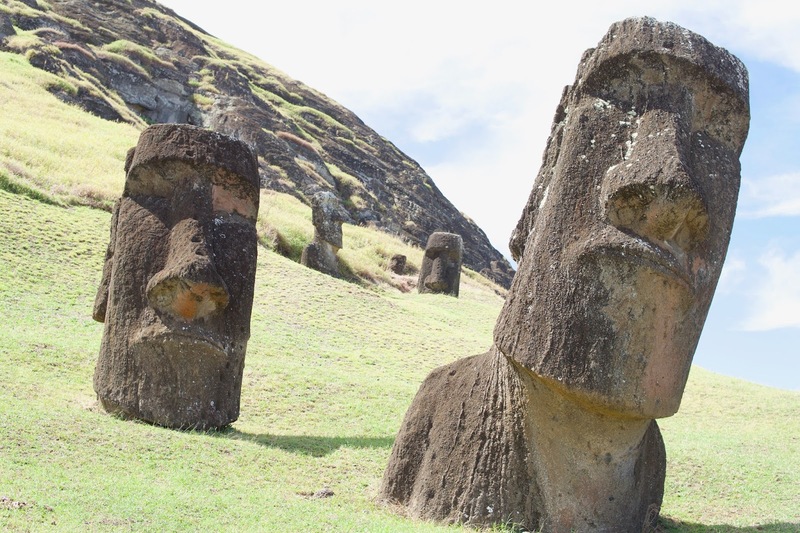 There are only two flights to Easter Island on LATAM (Chile's airline): one from Tahiti and one from Santiago. So I went to Santiago and had two days before flying to Easter Island. Santiago was my first time south of the equator. At home in Toronto, the water in my toilet bowl goes counterclockwise. In Santiago, at the toilet in my room at the Holiday Inn Express at the Santiago Airport, water in the toilet went clockwise. I was pretty excited to confirm this for myself!!!! A childhood question answered. (Of course, this isn't scientific, was it just the toilet in my room? Toilets at the hotel? The ones in Santiago? I don't know. My survey may not have been big enough to draw any real conclusions and quick internet research says the way water flushes in the toilet is more influenced by design, etc., but I only know what I know, and I believe! I believe!). As you may or may not know, Easter Island is one of the most remote inhabited islands in the world. It was weird landing. From my side of the plane, we were well on our descent and land was still not visible. Then suddenly, the island was there, after flying more than 4.5 hours with only ocean beneath us. More later, but here's the iconic shot.... (needs to be edited and adjusted because I deliberately slightly overexposed).